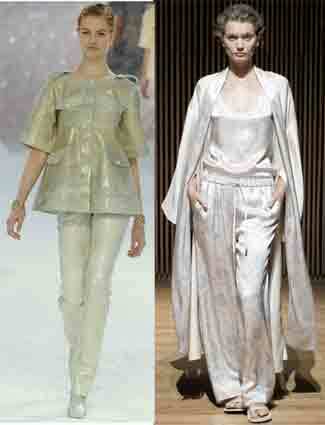 Apart from the peplum, there wasn’t a new major obvious shape influence on the catwalks for this spring/ summer season. There are shift dresses – good to see them back as they’re such useful shape for the half of the population who are rectangle shape. But several collections have over-large shift dresses which make even the models look fat. And there was a suggestion of wearing men’s striped flannel pyjamas as part of the ‘boyfriend’ look, but happily that didn’t last long. With versions in satin for party wear. The main repeating ‘stories’ that appeared from several designers are about colour, print, fabric. Choose which you will, as they suit different personal styles. The ones here are mainly from the UK Vogue February 2012 booklet on The Collections. Except for black with cream contrasts, most of the colours this season are light, and many outfits have an overall similar value of colour scheme. Not many big contrasts of light/ dark or neutral/ accent. Well, as an alternative to low contrast there is still colour blocking, some of it as strong as ever, though now some gentler. Or of course you could follow Pantone’s seasonal colour report and make a whole outfit in this season’s orange. 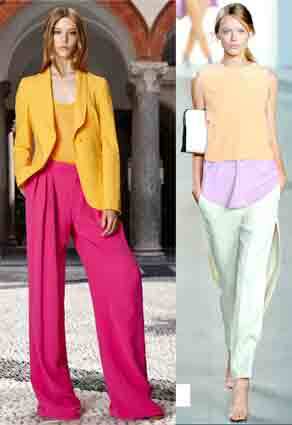 . .
Or high street fashion – pants in any bright colour, if you like strong colour but not orange. Or – it’s another season with lots of denim blue. African – the fabric styles, as well as leopard and zebra animal prints. Techno print – the sort of patterns you can only make on a computer. Print jackets and pants are also high style this season. Here in the UK we’re supposed to wear athletic singlets and fabrics covered in Union Jacks, patriotic for the Jubilee and Olympics. For everyday not just special occasions. Usually with simple shapes, minimalist rather than bling, possibly a sci-fi look. There are of course clothes with all sorts of interesting style elements and added embellishment – I’ve chosen examples which show the fabrics clearly. 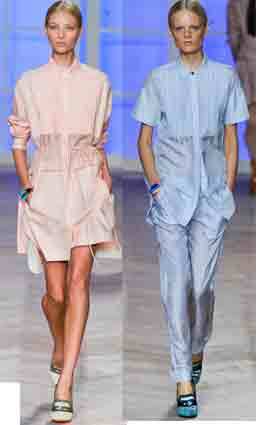 This entry was posted on June 30, 2012 at 8:28 am and is filed under current fashion. You can subscribe via RSS 2.0 feed to this post's comments. Both comments and pings are currently closed. Like your light hearted touch with the latest fashion! Like you, I am working on what suits rather than what’s ‘in’, but it’s still fun to see! Thanks. Great post! I so appreciate this fashion digest. I wonder what happened to my previous comment? I just tried to comment on your most recent posting. I am sorry you were ill and hope you are on the mend. I do not know why I am banned from posting any comments, however, and was not able to see any other way to contact you. I have enjoyed your postings but I get the message. I dunno, but “fashion” seems less and less relevant to normal people than ever. I’m just sewing what works for me for Autumn and living in walking trousers and base layer tshirts!